US Equities: Is It Too Quiet Out There? Recessionary fears. Uncertain US/China trade talks. Unsuccessful Brexit votes. Those were just three major concerns on investors’ minds last quarter, or so the financial news headlines suggested. Ultimately it didn’t weigh too heavily on investor sentiment given how little volatility the market experienced, at least according to our favorite measure. There were only eleven one percent days in Q1 2019 compared to the average of 13. There were more up 1% days than down days: 8 versus 3. 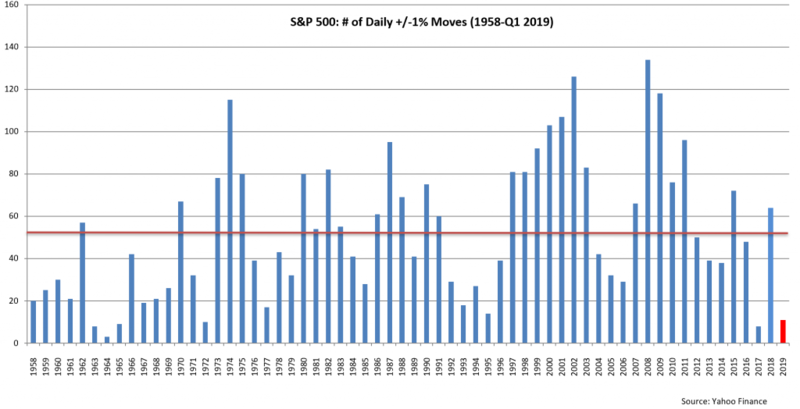 Also on the plus side, there’s only been six years where there have been over 100 one percent days, and all of them started the year with above average volatility in Q1: 1974 (115 annual total, 24 Q1), 2000 (103 total, 30 Q1), 2001 (107 total, 29 Q1), 2002 (126 total, 19 Q1), 2008 (134 total, 31 Q1), and 2009 (118 total, 41 Q1). The quiet start to 2019 is particularly unusual this late in the cycle. If you look at our bar chart of annual 1% days which we included below, there is a clear pattern over the past 60 years. Large market swings happen during the beginning of a bull market, abate, and then rise again towards the end of annual consecutive gains in stocks. Although this last cycle has chopped around more than usual, 2017 looks like the post-recession low with just 8 one percent days. Last year saw a big comeback in volatility, more in keeping with late-cycle norms. There were two key reasons volatility was low in Q1. First, a reversal in Fed policy to hold off on raising short-term rates. Second, a snapback in equity buying after a deeply oversold Q4 due to heightened tax loss selling. The latter is over of course, but the Fed seems certain in its stance to remain patient at least until the back half of this year. The 10-year Treasury went from a high of 2.79% in January to a low of 2.37% at the end of March. It’s now back to 2.47%, but still supportive of equity valuations as Nick outlined in last night’s Markets Section. Another way we track the seasonality of volatility is by looking at when the VIX peaks and troughs each year since it was created in 1990. While Q1-Q3 have 13 one percent days on average, Q4 has 14. This makes sense given that October is typically the most volatile month of the year as measured by the VIX. The VIX has reached its high for the year in October five times and has never bottomed during that month. It has also peaked in August five times, but has troughed twice during that month. As for the current quarter, the VIX has peaked three times in April, just once in May, and three times in June. It has also bottomed once during each of these three months. Even if the S&P 500 meets the Q2 average of 13 one percent days, that’s just one a week. Of course, volatility can turn and build momentum quickly. Post the financial crisis, there have been three other years with below average Q1 volatility: 2012 (7 one percent days), 2013 (7), and 2017 (2). Those first two years experienced above average volatility in Q2 (22 one percent days in 2012 and 17 in 2013) after a quiet Q1 before calming down again in Q3 and Q4. In 2017, a mild first quarter was followed by just 2 one percent days in Q2, 4 in Q3 and none in Q4. That last point brings up an interesting anomaly in the data series. There’s only been six quarters that have seen no one percent days over the last six decades. The first four happened in the 1960s: Q2 and Q3 1963, Q1 1964, and Q4 1965. The last two happened in just the past couple of years: Q4 2017 and Q3 2018. In sum, the market should be experiencing more volatility this late into the economic cycle, but it looks set to remain tame through Q2 barring a geopolitical/economic shock or Fed policy mistake. The latter is unlikely through June and other risks could pop up, but we’ll keep monitoring the data in case the tides turn rougher.